Important equations. Photo by the waving cat on Flickr. The abrupt departure of Stephen Elop as leader of the hardware devices business at Microsoft, which will instead be united under Terry Myerson, creates a big, obvious question: is Microsoft about to kill the Lumia smartphone business that it bought from Nokia for $9bn? Let’s go through the arguments for and against. Kill it because: the Windows Phone business loses money hand over fist – no phone maker, including Nokia, has ever managed to make it profitable. My analysis of its financials suggests that in Q1 it was losing around $40 per handset even if you assumed that featurephones made zero profit. Even assuming a loss per featurephone, the calendar Q1 (fiscal Q3) figures still showed a $29 per handset loss, even with generous assumptions about marketing and ignoring goodwill writeoffs. And Microsoft has warned that it’s going to take a whacking loss pretty soon on the phones division. The logical time to do that is at the end of the fiscal year – which is two weeks from now. Elop’s leaving just means the mess is already cleaned up when Satya Nadella goes on the analyst call. Other handset makers simply won’t touch Windows Phone; they know they can’t make money from it. Huawei’s consumer marketing chief famously said last September that it wasn’t worth doing. In addition, the number of Windows Phone users worldwide is really small in the context of the whole business. Out of more than 2 billion connected smartphone users, around 80m use Windows Phone – and the majority of those are using low-end versions. Why do they primarily use low-end phones? Because they’re not worried about apps, and that’s fine, because Windows Phone hasn’t managed to attract app developers to any great extent – it’s very much a distant third (or even fourth) for development. So Windows Phone has no momentum, is a money pit, and nobody’s interested in it – not the users or developers. Now we come to the reasons to keep it. Keep it because: Microsoft has to have a play in mobile because mobile is the biggest computing platform on the planet, bar none. Mobile is essential; if you aren’t in that, you simply aren’t in the game. True, Microsoft is writing software for rival platforms (sometimes before it does for Windows Phone itself) but to get any idea of the challenges and advances of what’s happening in the mobile world, you have to be a player yourself. Being exposed to the harsh vicissitudes of the market, and its demands, shows you what it is that people want and need much more immediately than if you’re trying to figure it out at second hand by observing Apple’s or Google’s manoeuvres with their operating systems. Not only that, but mobile is an intermediate stepping stone between the desktop and the coming internet of things – which you could call sub-mobile. 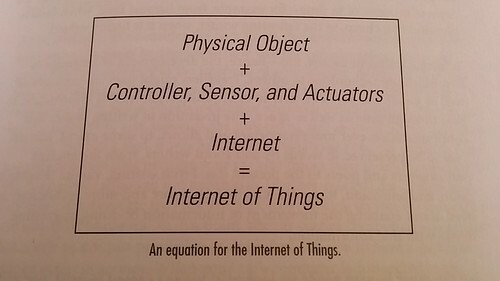 IoT depends on components that have become pervasive through their use in smartphones (GPS, accelerometers, camera sensors, fingerprint sensors, barometers…) and understanding how their capabilities interact, and fuse, and how their price points vary, is essential to seeing what the world is going to look like in five years’ time. Even to a Windows Phone sceptic like me (even though I really liked its interface when I first encountered it), it’s obvious that the second argument is by far the stronger one. It would be different if Microsoft couldn’t bear the cost of losses on Windows Phone (if it were, say, HTC), but the fact is that it can. It can bear those losses pretty much endlessly. • Windows Phone will continue to sell poorly, and lose money, but it won’t matter. For Microsoft, mobile is now a lost battle; it’s moving on to the next thing. Are you ready for the platform battle of the internet of things? This entry was posted in journalism, writing by charlesarthur. Bookmark the permalink. When you are in a hole stop digging. MS should drop Windows Phone and drop it now.